THIS is what keeps liberal weenies awake all night in a cold sweat! They see Never Trumpers who openly don’t like President Trump or, at best, are on the fence, and voila! they attend one Trump rally and suddenly they are singing God Bless America. Watch this before and after transformation of a guy who I would describe as “on the fence, leaning MAGA.” He was identified as a Never Trumper before the rally and points out that he did not vote for President Trump in 2016, but likes a few of the things he has done so far, like tax cuts and Supreme Court appointments. He is very serious and you can tell he is considering the “vote or don’t vote” decision very carefully. 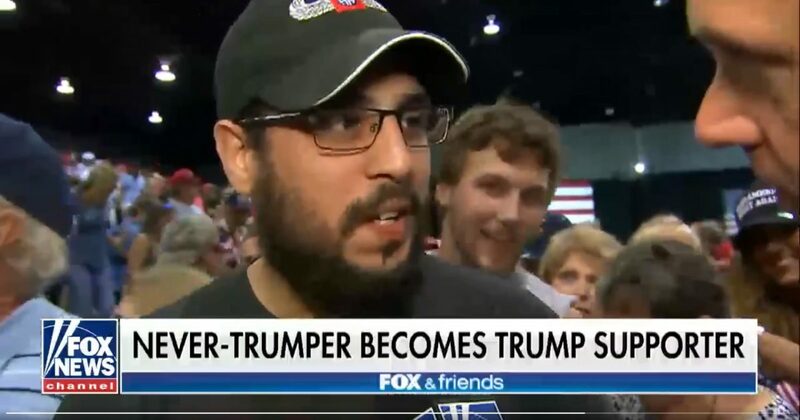 The same guy is interviewed again after the rally and he is clearly hooked on MAGA. He loves what he saw and heard and he is now all aboard the Trump Train. First, liberal weenies lost their advantage in the Supreme Court. In November, they are going to get pummelled at the polls, where We the People will return a Republican majority to both chambers of Congress. And their hope of retaking the White House is practically non-existent. The Democrat Party is a chaotic, near-bankrupt mess, filled with corrupt swamp rats and incompetent leaders. There r probably more dem. supporters of Trump then we realize-they r quiet & will not make their move until they have 2 vote. Watch out demoncrap politicians-u r on the way out. Welcome aboard new Trumpers!